The Render Impact Resource Center will help keep you up-to-date on all things related to motion graphics, marketing videos and digital signage content. Our resources, such as white papers and case studies, are chock-full of valuable information ranging from video walls to stadium LED screens and content creation to brand continuity. Learn about the latest news and trends along with best practices and tips for getting the most out of your motion graphics, marketing videos and digital signage system. A digital signage network can be a big investment, but one that’s worth the money. But all too often, deployers of digital signage focus on features such as screen types, media players and other hardware. 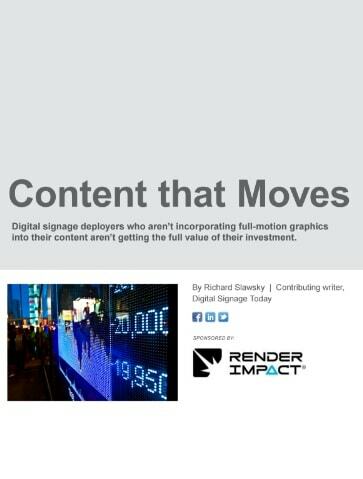 As a result, they tend to overlook the most important ingredient in a digital signage deployment: the content. 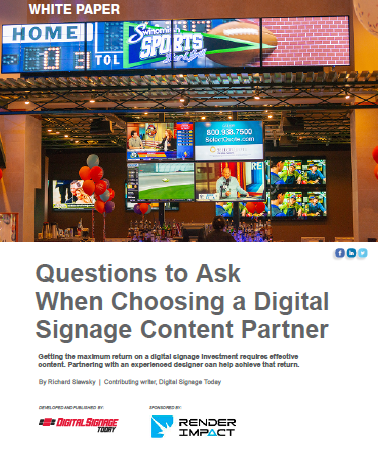 This white paper explains how getting the maximum return on a digital signage investment requires effective content - and partnering with an experienced designer can help achieve that return! on the hardware side; content is usually an afterthought. This white paper discusses the idea of planning an effective content strategy early in the process, making the best first impression possible and the benefits of working with a professional content creator. In the digital signage realm, some of the most effective content is that which incorporates movement, such as animation and full motion graphics. Digital signage deployers who aren’t incorporating full-motion graphics into their content aren’t getting the full value of their investment. In this white paper, we explore how digital technology has made it easier for nearly anyone to create their own content. We hear it all the time - I installed a video wall, now what content should I play on it? 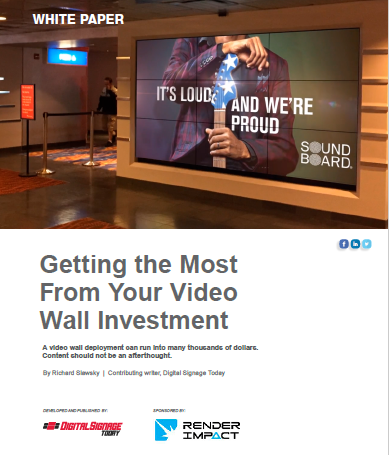 With the right content choices, video walls can serve as both an art installation and a communicator of your venue's message. This white paper details both the challenges and opportunities available to digital signage deployers concerning unique content creation. Video ads can change, but something should feel like it’s still the same company or brand when you lay all the ads out together across various customer touch-points and digital display formats. Customer-facing channels are continually changing, and it’s important for brands to keep their messaging consistent as those channels evolve. 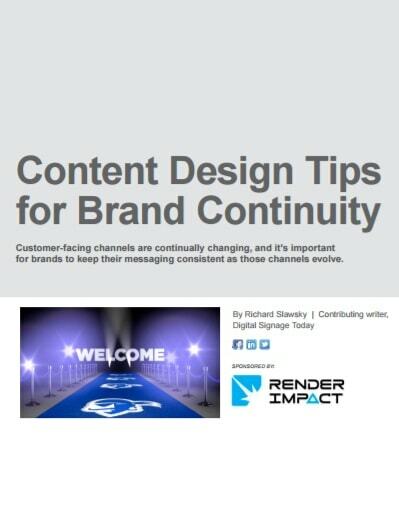 This white paper includes design tips for specific content channels to ensure brand continuity across many customer touch-points. 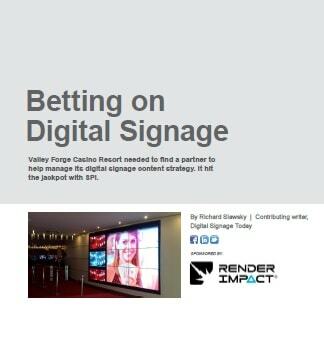 As Valley Forge Casino Resort prepared to open in 2012, one of its goals was to strategically place digital signage displays at every customer touch-point throughout the property. 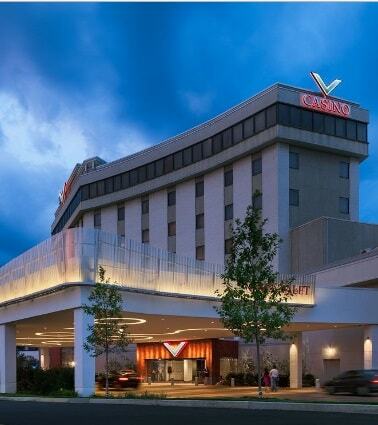 In partnership with Render Impact, Valley Forge Casino Resort guests are able stay up-to-date with current and upcoming events and promotions through the motion graphics playing on the digital signage displays around the casino floor. In the early part of 2016, Specialized Productions, Inc. (SPI) was experiencing significant growth in their creative division with more demand than ever for motion graphics and animation work. During this growth spurt, the sub-division, Render Impact, began to emerge. Tropicana knew they needed breathtaking content and synchronized multimedia shows on their new curved 4K digital signage pillars. One of the obstacles in accomplishing this task was to create enough continuous attention ­grabbing content so the shows would not repeat too often and get “played out”. The 4K LED canvas provides enough resolution to place all the video screens on one canvas when designing the content, meaning there would be no need to send an individualized feed to each specific screen on the enormous video canvas. Render Impact (SPI) created a variety of hourly shows including boardwalk DJ’s, music videos, logo animations, countdown timers, daytime screen-savers, patriotic holiday animations and more. MotorCity Casino Hotel dawned a new face using a melodic waterfall and other pieces of captivating, animated content for their new casino entrance 4K video walls. 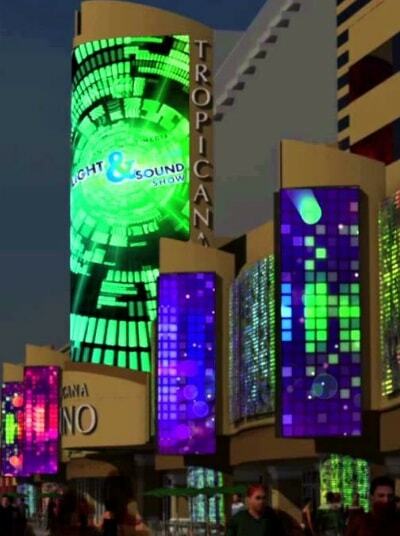 The casino-hotel commissioned Render Impact (SPI) to create a feeling of live, contemporary life using three-dimensional computer animation to have a waterfall fall over and interact with their logo as one of the featured content pieces for the new video walls. MotorCity conducted extensive research on various content strategies for their new 4K Video Walls with the guidance of Render Impact (SPI). They found that the new and exciting world of vivid 3D videos has transformed the way in which they are able to reach their audience. Render Impact (SPI) produced HD motion graphics for the facility’s captivating 28-screen feature video wall near the casino entrance. Custom, promotional content is combined with regional and artistic content to provide a visually stimulating and truly unique façade. Render Impact (SPI) also created the custom, branded content for all digital displays on property, including the iView screens (on all slot machines), digital menu boards, redemption kiosks, membership kiosks, slot top denominations, outdoor LED Pylon signs, hotel in-room channel, night club and Player Services displays. 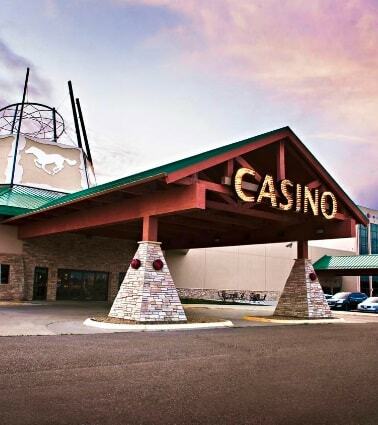 Render Impact (SPI) was selected by the Dakota Nation Gaming Enterprise to implement a strategy to overhaul the digital signage systems at Dakota Magic Casino Resort and Dakota Sioux Casino & Hotel. In addition to designing and configuring the overhaul at Dakota Sioux and Dakota Magic, Render Impact (SPI) has been retained to create dynamic digital signage content for both casino properties. We want to hear from you. Contact us today about your upcoming project. 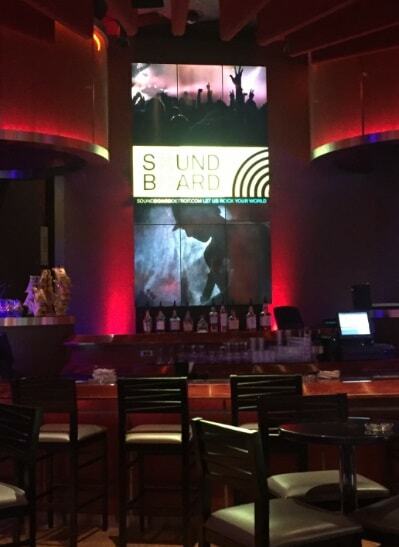 Render Impact is very prompt in turning around new creative for our LED screens in a short timeframe, whenever needed. We appreciate this partnership as we work in a very fast-paced, deadline-oriented environment and having partners that help simplify the process is imperative to our business. 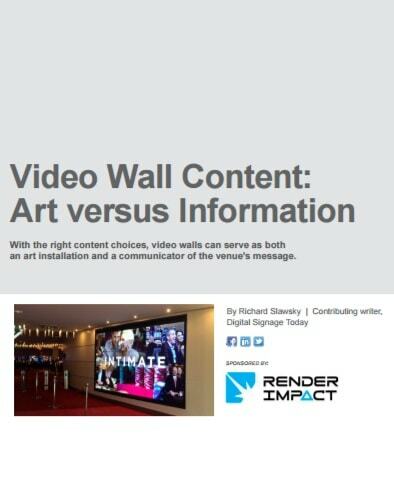 Render Impact has been a great resource for their outstanding quality and turnaround time. They are always able to take an idea and present several variations and possibilities. It’s great working with the whole team! We find that using Render Impact to create animated graphics for our digital signage keeps us in the mainstream and grabs the attention of our customers. We value the graphics as they have become a part of our monthly advertising and a quality asset to informing and entertaining our casino guests. When we launched our state-of-the-art LED sign in the heart of Times Square, we needed to make sure we were aligned with the very best in the industry. 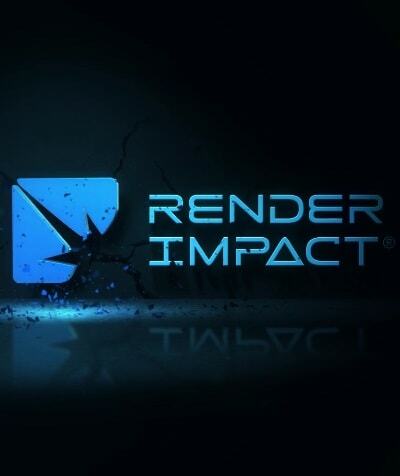 Render Impact demonstrated top tier, best-in-class services from the get go.